First of all, we would like to thank Mr Peter van Rooijen, managing partner at the accountancy firm Van Rooijen Accountants in Gorinchem for being the treasurer for the Golden Age Foundation from the founding in 2008 until the end of 2012. We are very grateful for all the administrative and fiscal work he has done for the Foundation. We are pleased that his brother, Mr Paul van Rooijen, who also works at Van Rooijen Accountants, has taken on the duties of treasurer from 1 January 2013. Even though the Golden Age Team has not acquired a painting by one of Gorcum’s Old Masters in the past months, there has been a lot of activity. 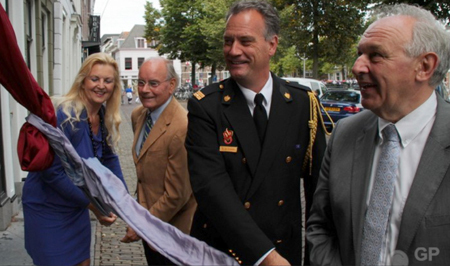 On 6 September 2012, in the presence of board members of many cultural organisations, Annet Ardesch and Bert Biemans unveiled a plaque at Eind 24 in Gorinchem together with mayor IJssels and deputy fire marshal Gijsbert van Pinxteren in honour of Jan and Nicolaes van der Heyden. Jan spent his early years at Eind 24 and it was here where Nicolaes was born on 18 June 1640. It was a conscious choice to pay attention to him as well, because together with his brother Jan he invented the fire hose. In 1671, the States of Holland gave both brothers the patent for the paddle wheel and the peristaltic pomp. In 1677, they also received the patent for the fire hose. In 1641, the Van der Heyden family moved to the Gasthuisstraat 36 where they lived until 1646. There was an addition to the family with the birth of Gijsbert in 1642 and a few years later, in 1646, another boy was born. That same year, the Van der Heyden family moved to Amsterdam. Until 1681, Jan lived in de Koestraat 5. In 1912, a beautiful plaque was placed on the façade of this house. This is the place where the painter Jan van der Heyden, born on 5 March 1637 in Gorinchem, lived from 1639 until 1641. He also invented the street light and together with his brother Nicolaes, he was the inventor of the fire hose as well. On 18 June 1640, Nicolaes van der Heyden was born here. In March 2012, the Golden Age Foundation Gorinchem presented this plaque. until his death on 28 March in 1712. 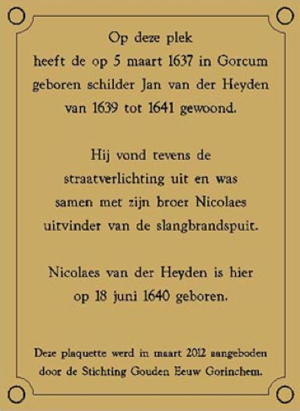 At the moment, we are discussing with the current owner of the Gasthuisstraat 36 in Gorinchem the possibility of placing a plaque for Jan and Nicolaes van der Heyden there. 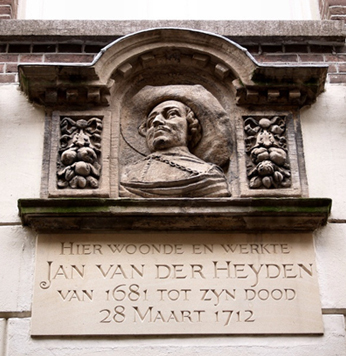 The owners of Molenstraat 29 have also declared that a plaque may be secured to their façade in memory of the 17th century painter Joachim Camphuysen. Sunday 7 October 2012, Bert Biemans gave a lecture on the occasion of the opening of the exhibition of the Nieuwe Haagse School (the New the Hague School) in the Museum Albert van Dyck in Schilde, near Antwerp. On 21 November 2012, Mr Biemans gave another talk in the Gorcums Museum in the context of the exhibition ‘Jan van der Heyden, the Dutch Leonardo da Vinc’. This lecture about the paintings of Jan der Heyden took place in the auditorium. On 25 November, Annet Ardesch and Bert Biemans visited the art fair PAN in the RAI in Amsterdam. Unlike last year, they bought no new paintings, even though there were several available by artists from Gorcum. Because an interesting painting by Aert van der Neer was put to auction during the Old Masters auction in Sotheby’s in London, Annet Ardesch and Bert Biemans travelled to London on 2 December, to take a closer look at the work. The painting, a landscape by night, proved to have several flaws and therefore they refrained from making a bid. However, they did seize the opportunity to look at the famous drawing of an old man by Raphaël, submitted by castle Chatsworth House, Devonshire, which was sold for 36 million Euros a few days later. They also viewed the genre painting by Jan Steen that yielded 6 million Euros at the same auction. 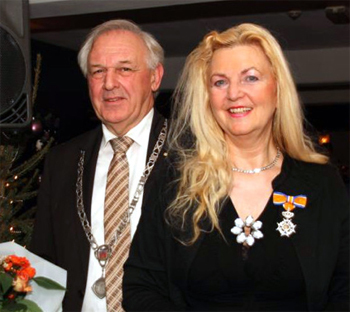 On 19 December 2012, during the Christmas Dinner in Hotel Gorinchem of de Gorcumse Open Tafel (Gorcum’s Open Table), an organisation that was founded in 1964 by mayor Ridder Van Rappard, Annet Ardesch, a member of the Golden Age Team, received a decoration, Knight in the Order of Orange-Nassau, a Dutch order of chivalry, from mayor P. IJssels. She received this honourable decoration for her active engagement in a great variety of organisations, including the Golden Age Foundation since its founding in 2008. On 24 January 2013, Bert Biemans gave a lecture for the Women’s Association De Passage, in the church De Heul in Gorinchem. He talked about the paintings of Jan van der Heyden and about the piece the ‘De burger van Delft en zijn dochter’ (A burgomaster of Delft and his daughter) by Jan Steen. At the Old Masters’ auction of Sotheby’s in January/February 2013 in New York, a painting by Govaert Camphuysen was presented. On closer examination of the piece over the internet and after having an expert on site look at the work, it was decided to refrain from making a bid. In the end, nobody made a bid on the painting, indicating we made the right decision. On 5 February 2013, the Dutch public-service broadcaster NTR aired the seventh episode of the show ‘De Gouden Eeuw’ (‘The Golden Age’). In preparation of this episode concerning the price of art, we talked for almost two hours with the editor of the programme about several aspects of the art market, including the number of paintings that were produced in the 17th century in the Republic. We also mentioned the thesis by Bert Biemans (which can be found on this website) which convincingly shows that the number of paintings is approximately 1 million. Nevertheless, in this particular episode of the programme an estimate of five million was mentioned by Eric Domela Nieuwenhuis which, given the number of painters, inhabitants and dwellings / buildings in the 17th century is impossible. 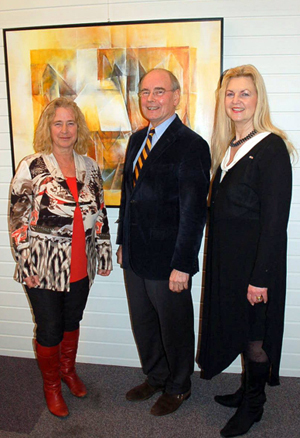 On 9 February 2013, Bert Biemans opened an exhibition by Annelies Dölle and Annet Ardesch. This exhibition called ‘Gezichtspunten’ (‘Viewpoints’) shows abstract paintings by Annelies Dölle and photographic pieces and figurative paintings by Annet Ardesch, in which the people of the city Gorinchem play a central part. 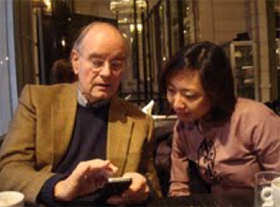 On 14 February 2013, Annet Ardesch and Bert Biemans had a conversation in Amsterdam with Ms Jungyoon Yang, a South Korean PhD student of art history at the University of Amsterdam. They discussed many subjects related to the Golden Age. In addition, they examined the possibility of cooperation between Gorinchem/The Netherlands and South Korea. On 18 March, Bert Biemans visited the TEFAF in Maastricht, where he spent most of his time looking at the Old Masters from Gorcum. In addition to paintings by Cornelis Saftleven, Jan Olis and Jan van der Heyden, art dealers had brought impressive pieces by Abraham Bloemaert and Aert van der Neer. No less than three paintings by Aert van der Neer were presented, including the work for which the Golden Age Team had travelled to a well-known auction house in London in December 2012, a trip that was mentioned earlier in this newsletter. At the time, we were happy to have refrained from making a bid on the painting because of the poor quality of the painting itself, as well as the overall condition of the piece. At the auction in London, the painting was sold for a modest amount. At the art fair in Maastricht, a prominent European art dealer presented the painting, cleaned and in a beautiful frame, for a price that was considerably higher. However, we remain convinced that this painting does not fit the collection of the Gorcums Museum. Mr Marcel Roethlisberger had investigated a large unsigned and undated painting and attributed the work to Abraham Bloemaert. This painting was present at the TEFAF, as part of the collection of an American art dealer. However, this work is not of interest to the Gorcums Museum either. The painting by Jan van der Heyden that was put up for sale at the TEFAF by a European art dealer was relatively small and expensive for the Golden Age Gorinchem Foundation. After looking at what the different art dealers had to offer in terms of work by the Old Masters, we had to conclude that good paintings by Gorcum’s Old Masters that fit our budget are rare. Therefore, we will have to stay on the lookout for works that might be offered by art dealers and individuals and at auctions in the future. Visiting art fairs and auctions has brought about certain costs. The year 2013, therefore, will be marked by finding new sponsors and possibly new paintings by Gorcum’s Old Masters as well. We have already made the first appointments with potential sponsors.